It has almost been 4 months since my last post, so it’s time for an update. For those of you who visited my Soundcloud profile lately, you might have wondered where all my tracks have gone. Well I decided to give up on Soundcloud because the amount of people following me there is not as big as I had hoped for. Also there is not a lot of interaction possible in the Soundcloud app, so basically I don’t think it is fun anymore. Having that said.. I want my Youtube channel to be more successful, so I decided to upload more video’s on a regular basis. Not only covers, but my own music as well. I know CD Baby does upload my music to Youtube Music, but this is only available in USA region and not in Europe for some reason. My fanbase on Youtube is growing and I get a lot of nice responses there. So, after summer it’s time to get into the studio again. I am working on some new music for a project with I am not allowed to tell much about. But it will be a nice remake of some iconic 80’s Spacesynth music. 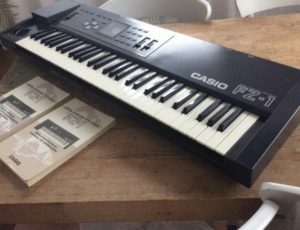 Especially for this project I bought a Casio FZ-1 sampler to be able to mimic the sound they used. Also this year I will participate in the annual Space Holidays and Space Odyssey compilations, in fact I have some tracks already finished. Some people might have noticed that I am also trying to produce some trance music lately, so expect me to produce some of that as well this winter. So thanks for your attention 🙂 Follow and subscribe if you like, and see you next time.